I’m interrupting the flow of daily A-Z posts for two reasons. The first is that I have paid a (blog) visit to Ailsa Abraham at Bingergread Cottage. I had so much to say (prompted by her hospitality, or was it something else?) that she divided it into two parts: one and two. The second reason is to say something about the festival of Passover. I don’t think I’ve ever posted anything about it, because it always comes at the same time as the A-Z challenge. 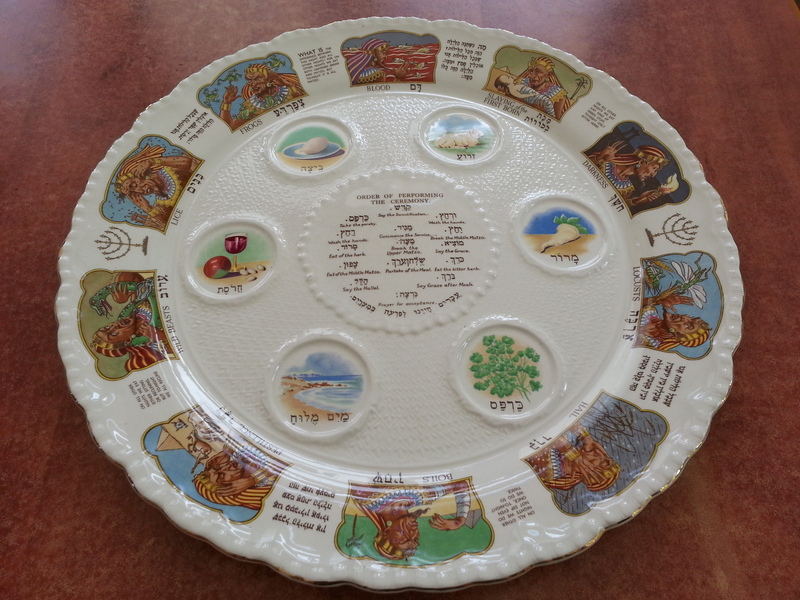 There is so much I could say, but I’ll just tell you about the story behind our Seder plate. The word seder means ‘order’ or ‘procedure.’ In this case, it refers to the ceremony and festive meal observed at the start of the week-long festival. 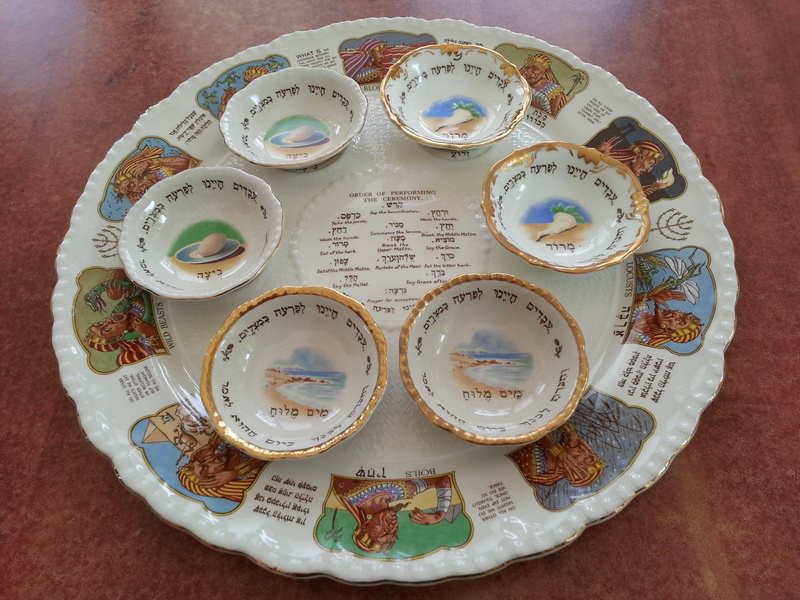 On the Seder plate are six different items of food that symbolise aspects of the Passover story: the exodus from Egypt. We never had a special plate for this until we inherited this one when my mother died in 2011. But I knew the story of how my parents had acquired it. They were on holiday in Ilfracombe in Devon one year and happened to spot this beautiful plate adorned with pictures of the ten plagues in the window of an antique shop. It wasn’t expensive, so they went in to enquire. The underside of the plate shows that it was made in England by Royal Cauldon. The shopkeeper had no idea what it was. There were dishes to match the plate. Unfortunately, two of them were broken and had been glued together (or did my mother do the glueing – I’m not sure). Also, some dishes are missing while others are duplicated. But they bought the set anyway, and now we use it every year. And each year we comment on the mistake in the Hebrew. One of the food items is salt water. In Hebrew, the word for water is always plural and the adjective (salted) has to agree with the noun. Here it doesn’t. “The Twelve Days of Christmas” is a cumulative song, meaning that each verse is built on top of the previous verses. I had heard this song before, but I think I need to know more about it in order to understand Sue’s poem. Nevertheless, it got me thinking about all the cumulative songs I know. Chad Gadya, a song in Aramaic that tells the story of one little goat. Echad Mi Yodea, which, like Green Grow the Rushes, O, allocates an object to each number. Apparently cumulative songs are popular with choirs because the words are easy to remember. I certainly remember the words of those Passover songs. Do you have any favourite cumulative songs?